Pizza, Pies, Pasta, Bakery, Salads, plus other food products. pizzas / food products deserve a secure, easy way to carry them. number of pizzas / food products purchased. LICENSE AGREEMENT TO MANUFACTURE IS AVAILABLE TO ANY INTERESTED COMPANY. The TRI-BOX food carrier is a game changer and life-style changing! the TRI-BOX food carrier is the solution to transporting food. not just cash in big paychecks. Better than a bag, great for advertising and building customer loyalty. Patent Approved Food Carrier. The TRIANGLE shape carrier can securely carry over 18.5+ pounds of food products. Based on the weight of 1.-1/4 lbs. for a full size 11" x 12" pizza slice. CUSTOMER CONVENIENCE can make a immediate long lasting powerful impression. 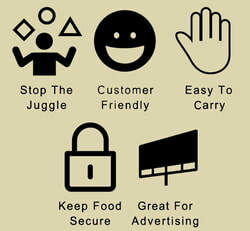 OUR FOOD CARRIERS protects your food and demonstrates your concern for your customers. Made for more than pizzas. Great for bakery boxes. bring food to your home or office with out a struggle. ​ of transporting food boxes. TRI-BOX can be custom made with adjustments and optional panels to fit your food containers and your business model / sales performance. TRI-BOX™ is a patent approved carrier for transporting multiple different shaped cartons of food products. It easily transforms and can be custom made to fit rectangular, triangular, square, and round containers. a subsidiary company of Press Proof Printing. is available to any interested company.